New Zealand has two species of native freshwater eel, longfins and shortfins. Longfins are found nowhere else. They live further inland than shortfins, and get older and bigger: over a century old, for ones that are 2 m long and as thick as your leg. They’re down to about 20% of their former numbers, and the population has been declining for decades from overfishing, pollution, and forest clearance. If it drops any more, DOC will have to declare them an endangered species. Every longfin eel in NZ is a virgin. At the end of their lives, some time between 30 and 100 years old, they head out to sea, spawn in the ocean near Tonga, and die. The tiny fry make their way back to NZ and work their way up rivers as elvers, where they settle down and slowly grow bigger. So every eel we catch is one that has yet to breed. And yet, amazingly, there’s a commercial export industry in longfin eels. It’s perfectly legal to catch tonnes of them every year, and export them alive to countries who long ago wiped out their own eel stocks but still think eels are a delicacy. The commercial eel industry employs maybe 100 people, mostly part-time eel fishers, and is worth only $0.5 million a year: a tiny fraction of our exports. Quite a bit of taxpayer money is spent propping up this industry though. Apart from the PCE report, the Ministry for Primary Industries (MPI) assembled a panel of international experts to comment on the longfin monitoring, ran workshops, consulted, and has now prepared a discussion document on the South Island quota, which it will have to administer, collect data on, make regular reports, monitor… It seems like a lot of effort so that 30 full-time eel processors can keep making private profits off a public resource. One of the recommendations was that the MPI set up a separate quota for the South Island longfin stocks (they’d been lumped in with shortfins) so the fishery could be at least monitored and controlled. The MPI are setting the quotas for different regions in the South Island right now, and are inviting public submissions, deadline Monday 11th, 5pm – although submissions opened on June 13, fisheries biologists were apparently only told a week or two ago, and the word’s hardly gotten out. There’s a Forest and Bird blog post with some advice on making a submission (it’s quick and easy, just write a clear, concise email stating your interest in this and your opinions and suggestions). Here’s mine. 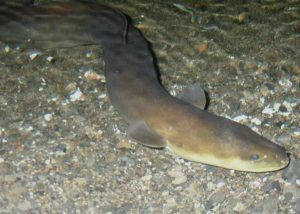 I am writing this submission on discussion paper 2016/15, Review of Management Controls for the South Island Longfin and Shortfin Eel Fisheries (LFE 11–16 & SFE 11–16) in 2016, to comment specifically on the South Island longfin eel fishery. I am a biologist, and Curator of Natural History at the Whanganui Regional Museum. Whanganui has a deep connection with tuna and their harvest, and local iwi have resolved to improve the health of the river so stocks can recover; in my job I talk to the community about freshwater health and the biology of our native fishes. And of course as a South Islander, and a New Zealander, I’m a stakeholder in the health of South Island freshwater ecosystems, including longfins. The independent panel commissioned by MPI in 2015 concluded that, although longfin numbers had probably dropped 80% from its original level, the decline may have slowed or “perhaps even slightly reversed” in the last five years. I am concerned that MPI has represented this as evidence that longfin eel stocks in the South Island are now recovering and can continue to support a commercial eel harvest. There could be numerous explanations for the small uptick that is being used to claim longfin stocks are now recovering. Given longfins take well over a decade to reach a commercial catch weight, any real population increases would have to have begun at the height of mass dairy conversion and degradation in water quality we are observing in the South Island. Conversely, impacts being made today on breeding success and the recruitment of elvers into waterways will not affect the commercial eel harvest for over a decade. So it is unlikely that variations in catch per unit effort now, in isolation, are actually giving us good information on longfin population trends. The independent experts commissioned by MPI found numerous problems with measures currently being used to assess eel numbers, and recommended that an integrated, long-term monitoring process begin, using a wide range of techniques and assessing all potential threats to longfins. Even adjusted for unit effort, catch rates represent the behaviour of fishers as much as the number of eels present – eel fishers are highly mobile and target just the areas where eels can be most easily caught, which can mask pervasive declines in the population. There appears to be a difference of opinion between MPI and the Parliamentary Commissioner for the Environment as to whether the longfin population is at a harvestable level, and whether it is continuing to decline. It would seem impossible to allow a commercial fishery until, at the very least, both of these questions are settled to the satisfaction of the research community. The South Island longfin quota for 2016 should be reduced to zero (0) tonnes, and maintained thus for 20 years, during which longfin populations will be monitored to determine if they are in fact recovering. The quota should be uniform for the entire South Island, as elvers do not return to a specific stream, and so the entire breeding population of New Zealand is a single management unit, with harvestable eels in a few areas supporting the eel population of the entire country. It seems odd to allow effectively unrestricted harvest of longfins in areas like the West Coast (LFE 16) when these populations are supplying elvers, and thus determining stock levels, for the rest of the South Island. If the quota is not reduced to zero, it should be reduced to a level well below the current commercial take, as one of the few methods available to immediately help reverse the decades-long decline of longfins. The “nominal catch” levels indicated for LFE 11, 12, 13, & 14 would be appropriate, and should be extended to LFE 15 and 16, instead of the proposed levels of half the current average commercial catch (LFE 15) or an unrestricted continuing commercial catch of 25 tonnes (LFE 16). MPI should take the initiative in supporting a research programme, run by all fisheries biologists and ecologists with expertise in longfin eels, that will clearly determine a) a population level of longfins able to support a commerical harvest (for example, 30% of the pre-fishery stock) and b) robust, well-accepted methods of determining whether that level has been reached. Until those methods have been settled on, and until the population has recovered to that agreed level, the TACC should remain at 0 or nominal. This research programme should be totally or substantially funded not by the New Zealand taxpayer, but by the commercial longfin industry. If the commercial eel industry is not willing to help determine if longfin stocks can be sustainably harvested, they should no longer be allowed the privilege of taking and exporting this publicly-owned resource. Other extractive industries are responsible for determining the environmental impact of their activities: the eel fishery should be no exception. Recreational and traditional quota should remain unchanged if not reduced to a nominal level, but a consultation and education programme should begin with iwi to give each region the option of setting traditional harvest levels to 0 – effectively, a rahui – for a similar period, and working with ecologists to monitor the health and population levels of their local longfin stocks. Quite apart from the scientific arguments, though, about methods for assessing stock levels, I would like to propose another reason why the South Island longfin quota be set to zero. I believe that if most New Zealanders understood the population trends and breeding biology of longfins, and that this species was nevertheless still being caught and exported for profit, they would vote to shut the industry down tomorrow. If it were similarly-threatened native birds being harvested for export, there would be public outrage. Future generations will shake their heads in disbelief that we allowed a commercial longfin industry to carry on into the 21st century, long after the decline of this species was clear; just as we do today when we recall New Zealand was still carrying out commercial whaling into the 1960s. Thank you for considering this submission. I am happy to be heard in person in support of it if required. This entry was posted in Field Notes, Moans and Whinges on 9 Jul 2016 by Mike. Hi there – my 10 year old is doing a project and speech about long fin eels (September 2018). She’d really like to include a recommendation about something practical and specific people can do to lobby the powers that be about the need to stop commercial fishing of long fins. Is it still best to send an email to FMSubmissions@mpi.govt.nz? No, you’d really need to be submitting about a specific proposal; the North Island longfin fishery is up for review this year I believe. But it can’t hurt for her to send a general email.